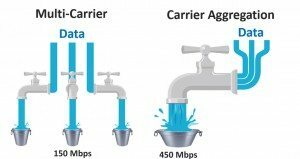 What is LTE Carrier Aggregation ? CA permits LTE to achieve the goals mandated by IMT-Advanced while maintaining backward compatibility with Release-8 and 9 LTE. Release-10 CA permits the LTE radio interface to be configured with any number (up to five) carriers, of any bandwidth, including differing bandwidths, in any frequency band. 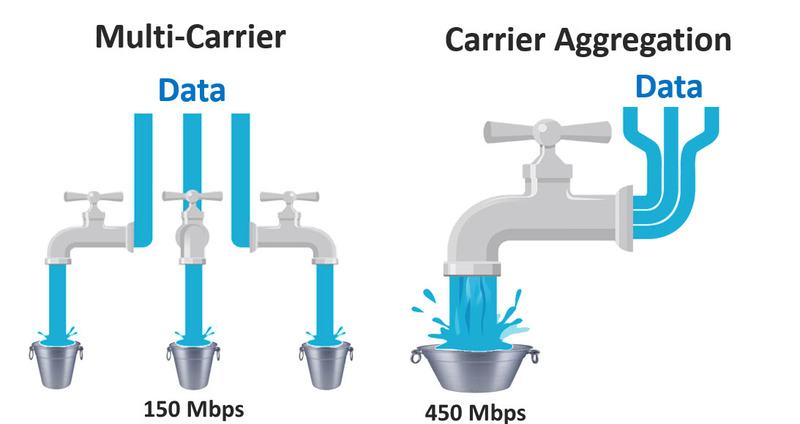 Carrier aggregation can be used for both FDD and TDD. The downlink and uplink can be configured completely independently, with only the limitation that the number of uplink carriers cannot exceed the number of downlink carriers. Each aggregated carrier is referred to as a component carrier, CC. The component carrier can have a bandwidth of 1.4, 3, 5, 10, 15 or 20 MHz. With a maximum of five component carriers, the maximum aggregated bandwidth is 100 MHz. 3 types of allocation have been defined in 3GPP to meet different operator’s spectrum scenario. The introduction of CA renders the previous conceptions of “frequency band” and “bandwidth” ambiguous. Indeed, LTE systems can operate on variable bandwidth for a given band ranging from 1.4 MHz to 20 MHz. Therefore 3GPP has introduced terminology and notation which serve to more clearly express the radio interface configuration. The UE’s are defined by a CA Bandwidth Class.